I originally discovered Blithe and Bonny products at Anthropologie and later at a darling store in Capitola called Three Little Birds. The scents in this line of candles, body lotions, lip balms, soap and more are intoxicating, subtle, and leave a woman feeling like the prettiest girl in the room. 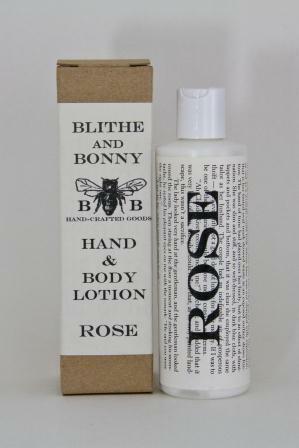 It was to my pleasant surprise to find that Blithe and Bonny products are actually hand-crafted and manufactured in the small town of Bonny Doon in Santa Cruz County. The family-run business has been selling their goods for the last 10 years and they practice environmentally-conscious values by never testing on animals, all products are paraben-free, and the packaging—if you look closely—is actually made up of old book pages. 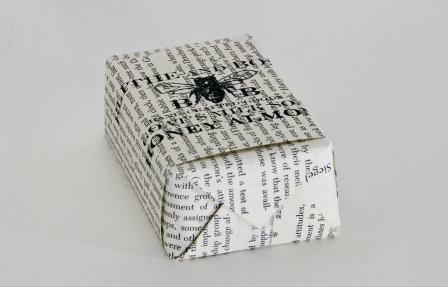 Every item is enclosed this way, creating an adorable gift wrap that's unique to each product. 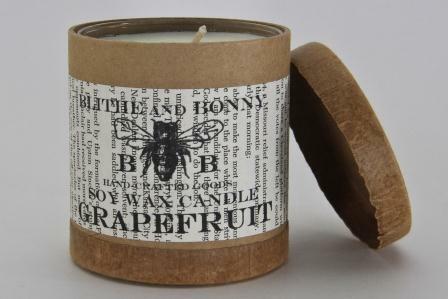 The line offers a slew of beautifully scented soy wax candles including the grapefruit variety above. Personally, I never thought I'd have a thing for fruity smelling things (especially having spent time in those awful lotion stores in malls), but this is nothing of the sort. The scent isn't what you'd expect; it's everything you'd hope for: It's simple, warm, elegant and delicate. The grapefruit notes are so light that instead of thinking about eating a piece of citrus for breakfast, you're whisked away to an outdoor summer party, where the air smells fresh, clean and comforting. Likewise, Blithe and Bonny goat milk soaps are exquisite. The variety above is Honey Almond and while the scent does offer those notes, it smells nothing like a bakery and everything like a woman's new, favorite, just-barely-there perfume. A delightful side-effect is that after washing our hands with this soap, not only do your mitts retain a sweet aroma, but your bathroom smells like you walked into a luxurious spa in a European country. Amongst the copious offerings of candles, soaps, bath salts and more, are the body lotions. By far, this Rose scent stole my heart the moment I opened the bottle. Again, the smell is very delicate, just what you require from high-end (but affordable), locally grown bath and body products. Blithe and Bonny—it's the best treasure I've found in a long time. Find Blithe and Bonny products at blitheandbonny.net, anthropologie.com, and Three Little Birds, 504D, Bay Ave., Capitola, (831) 462-2473, 3littlebirds.net.